Background: Giving a time gap and distance during curing can decrease the polymerization shrinkage. Aim: To evaluate the effect of time gap and distance between the curing tip and restoration on the polymerization shrinkage, degree of monomer conversion (DOC), and microhardness of a nanohybrid composite. Materials and Methods: A total of 50 standardized cylindrical specimens (Z350, 3M ESPE) were fabricated using a brass mould. The curing was done in contact with the sample surface for 20 seconds in the control group. In the four experimental groups, curing was initiated at 1-cm distance, followed by variation in the time gap and the curing cycle. The polymerization shrinkage, DOC, microhardness was calculated. Statistical Analysis: One-way analysis of variance (ANOVA) and post hoc-Dunnett test were used to analyze the data. Results: Curing at 1-cm distance for 10 seconds with a gap of 10 seconds and finishing the curing cycle with 20 seconds at 0 cm proved to be an appropriate technique to reduce the polymerization shrinkage without significantly affecting the DOC and microhardness. Conclusion: A simple innovative modification of varying the distance of curing and a time gap in the curing cycle can decrease the polymerization shrinkage without affecting the DOC and microhardness. There are few studies in literature comparing the physical properties of nanohybrid composites with varying distances of light curing intensity, and there is less research evaluating the effect of a short gap within the advocated curing time. Therefore, the aim of the present study was to evaluate the effect of varying the distance and giving a short time gap during the curing cycle on the polymerization shrinkage, degree of conversion and the hardness of a nanohybrid composite. Nanohybrid composite resin (Filtek Z350 Universal Restorative, 3M/ESPE, St. Paul, MN, USA) of A2 shade was used in this study. Cylindrical specimens were fabricated using a brass mould of 5-mm diameter and 2-mm depth, for the standardization of the samples. This mould was constructed as two parts with a split in between for easy disassembly of the cured specimen. The whole assembly was made to rest in the brass block, with four corner slots for additional support. 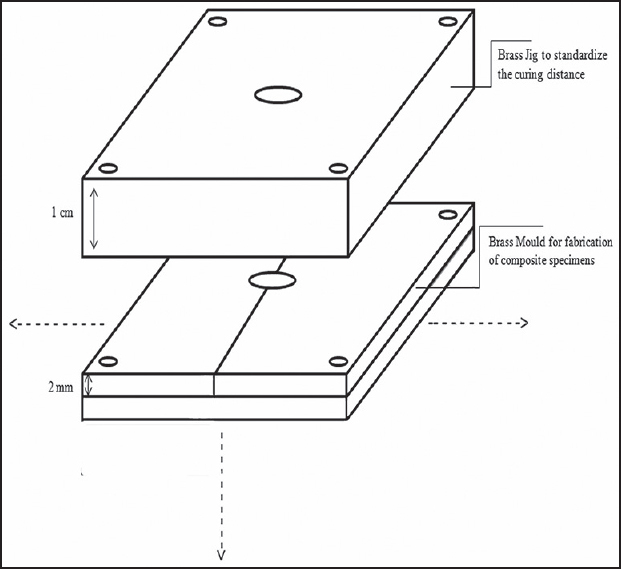 A brass jig was fabricated to maintain 1-cm and 2-cm distance from the curing tip to the composite [Figure 1]. The inner surface of the jig was polished to prevent adhesion of composite resin to the mould. A pilot study was done with 1-cm and 2-cm curing distance. Since 2-cm distance did not show any favourable results within the selected parameters, the final study was done with 1-cm curing distance. 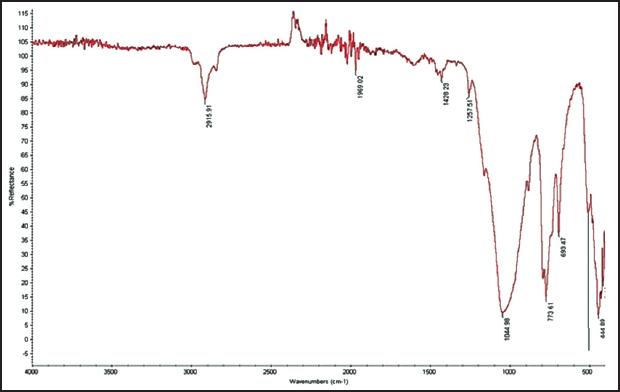 Light polymerization was performed with quartz-tungsten-halogen light curing unit (Elipar 2500- 3M ESPE, St. Paul, MN, USA), at 600 mW/cm 2 and periodical monitoring of the curing light intensity was done with radiometer (Optilux Model 100, SDS Kerr; Donbury, CT, USA). GROUP C (control): Curing was done in contact with the sample surface (0-cm distance) for 20 seconds according to manufacturer's instructions. Group 1: Curing was initiated for 10 seconds at 1-cm distance between the light curing tip and the composite surface, immediately, followed by 20 seconds curing in contact with the sample surface. Group 2: Curing was initiated for 10 seconds at 1-cm distance, a time gap of 10 seconds was given, followed by 20 seconds curing in contact with the sample surface. Group 3: After curing for 10 seconds from 1-cm distance; a gap of 10 seconds was given, followed by curing for 10 seconds in contact with the sample surface. This was again followed by a gap of 10 seconds and completing it with 10 seconds curing in contact with the sample surface. Group 4: Curing was done at 1 cm for 10 seconds, followed by curing in contact with the sample surface for 10 seconds. Then a gap of 10 seconds was given and final curing was completed with 10 seconds at 0-cm distance. Statistical analysis was done using statistical package of social sciences (SPSS) version 10.0 and the data were analysed using one way analysis of variance (ANOVA) and the multiple comparisons between the experimental groups were done with post hoc-Dunnett test. A probability value less than 0.05 was considered to be statistically significant (P < 0.05). The mean values for the polymerization shrinkage, degree of conversion, and microhardness are tabulated [Table 1]. The results showed that there was no statistically significant difference between the control and group I for polymerization shrinkage. 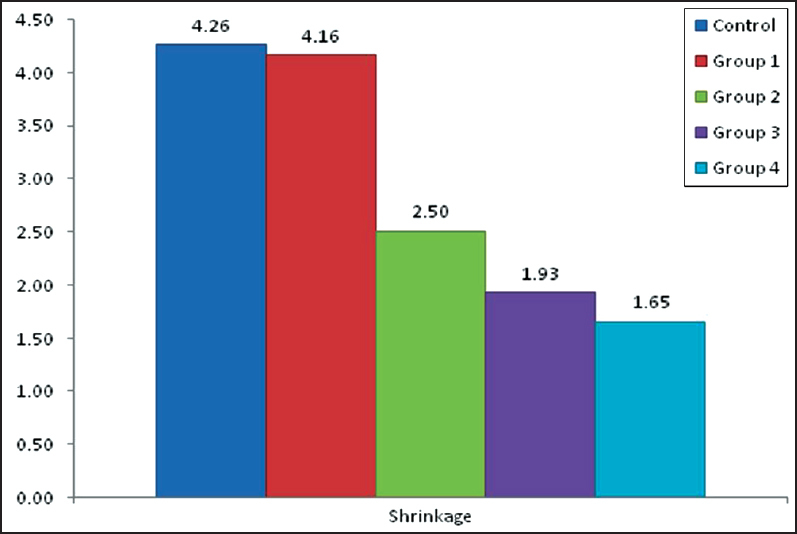 But there was a reduction in the polymerization shrinkage in groups 2, 3, and 4 in comparison with the control group [Figure 3]. This reduction in polymerization shrinkage was statistically significant (P < 0.05). 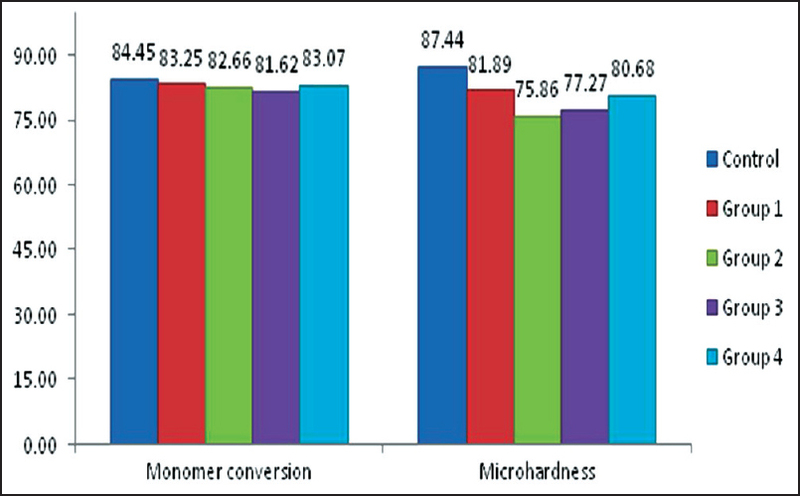 With regard to microhardness, the mean of the control and the four experimental groups were 84.45, 83.25, 82.66, 81.62, and 83.06, respectively, which was statistically significant (P < 0.05) and clinically acceptable  [Table 2] and [Figure 4]. The control group showed the highest polymerization shrinkage (4.25%) which is comparable to other studies which is typically in the range of 4-5% and results in the development of internal stresses. ,, This is because of the continuous light with highest intensity resulting a significant rise of temperature. ,, Experimental groups 2, 3, and 4 showed a statistically significant reduced polymerization shrinkage compared to the control group. The least polymerization shrinkage (1.65%) was observed in group 4. The degree of polymerization has a potentially large role in determining the ultimate physical and mechanical properties of the material. The maximum DOC was observed in the control group (84.45%), followed by group 1 (83.25%) and group 4 (83.06%) with a statistically significant difference between the control group and the experimental groups. The DOC in all the experimental groups is within the clinically acceptable as the DOC of most of the composites are in the range of 60-80%. , The fact that all the specimens in the experimental groups were cured for 20 seconds at 0-cm distance albeit periodical gaps has ensured optimal DOC. The normal pulse delay technique incorporates a waiting period between exposures. Curing commences at low intensity - 150 mW/cm, 2 and is then paused for a given period ranging from few seconds to few minutes, light is then applied at high intensity (800-1200 mW/cm 2 ) in one or more pulses. This technique has been shown to achieve a constant DOC, reduced polymerization shrinkage, fewer gaps in the polymerized resin matrix with a better resin-tooth interface compared to the conventional curing cycle. According to Yoshikawa et al.,  the greatest reduction in polymerization shrinkage, of up to 34%, is achieved with a waiting period of 3-5 min. The slow curing of the nanohybrid composite Z350 in the pulse delay curing mode produces reduced polymerization contraction in cavities due to stress relief. The short flash of light during the first part of the curing cycle, followed by a time gap before the final cure has resulted in significant reduction polymerization shrinkage (up to 38%) without affecting the mechanical properties. The result of this study has shown that a conventional QTH curing light can achieve a far better result, comparable to a variable intensity curing unit, by a simple modification of curing cycle. Further studies on the effect on the technique on stress induced during polymerization on natural tooth needs to be investigated. There is a significant reduction in the polymerization shrinkage of the nanohybrid composite due to variation in the curing distance and the time gap in the curing cycle. Among the experimental groups, group 2, where curing was done at 1-cm distance for 10 seconds with a gap of 10 seconds and finishing the curing cycle with 20 seconds at 0 cm proves to be an appropriate technique to reduce the polymerization shrinkage without significantly affecting the DOC and microhardness of the nanohybrid composite. Asmussen E, Peutzfeldt A. Influence of pulse-delay curing on softening of polymer structures. J Dent Res 2001;80:1570-3. Davidson CL, Feilzer AJ. Polymerization shrinkage and polymerization shrinkage stress in polymer-based restoratives. J Dent 1997;25:435-40. Chye CH, Yap AU, Laim YC, Soh MS. Post-gel polymerization shrinkage associated with different light curing regimens. Oper Dent 2005;30:474-80. Chen MH. Update on dental nanocomposite. J Dent Res 2010;89:549-60. Sakaguchi RL, Douglas WH, Peters MC. Curing light performance and polymerization of composite restorative materials. J Dent 1992;20:183-8. Ernst CP, Brand N, Frommator U, Rippin G, Willershausen B. Reduction of polymerization shrinkage stress and marginal microleakage using soft-start polymerization. J Esthet Restor Dent 2003;15:93-103. Froes-Salgado NR, Silva LM, Kawano Y, Franccic C, Reis A, Loquercio AD. Composite pre-heating: Effects on marginal adaptation, degree of conversion and mechanical properties. Dent Mater 2010;26:908-14. Ruchi DS, Jaideep S, Arunagiri D. A comparative study of degree of conversion (DOC) of hybrid composite resins with nanocomposite resins when exposed to visible light cure (VLC) unit and light emitting diodes (LED)-an in vitro study. Indian J Dent Sci 2010;2:6-9. Ferracane JL, Greener EH. Fourier transform infrared analysis of degree of polymerization in unfilled resins - methods comparison. J Dent Res 1984;63:1093-5. Park SH, Noh BD, Cho YS, Kim SS. The linear shrinkage and microhardness of packable composites polymerized by QTH or PAC unit. Oper Dent 2006;31:3-10. Hanadi YM. Post-irradiation vickers microhardness development of novel resin composites. Mater Res 2010;13:81-7. Leprince JG, Leveque P, Nysten B, Gallez B, Devaux J, Leloup G. New insight into the "depth of cure" of dimethacrylate-based dental composites. Dent Mater 2012;28:512-20. Cekic-Naqas I, Eqilmez F, Erqun G. The effect of irradiation distance on microhardness of resin composites cured with different light curing units. Eur J Dent 2010;4:440-6.
de Gee AF, Feilzer AJ, Davidson CL. True linear polymerization shrinkage of unfilled resins and composites determined with a linometer. Dent Mater 1993;9:11-4. Sakaguchi RL, Sasik CT, Bunczak MA, Douglas WH. Strain gauge method for measuring polymerization contraction of composite restoratives. J Dent 1991;19:312-6. Knezevica A, Sariri K, Sovic I, Demoli N, Tarle Z. Shrinkage evaluation of composite polymerization with LED units using laser interferometry. Quintessence Int 2010;41:417-25. Elhejazi AA. The effect of temperature and light intensity on the polymerization shrinkage of light cured composite filling materials. J Contemp Dent Pract 2006;7:12-21. Karthick K, Sivakumar K, Geetha Priya PR, Shankar S. Polymerization shrinkage of composites- a review. J Indian Dent Assoc Sullia 2011;2:32-6. Hervas Garcia A, Martinez Lozano MA, Cabanes Vila J, Barjau Escribano A, Fos Galve P. Composite resins. A review of the materials and clinical indications. Med Oral Patol Oral Cir Bucal 2006;11:E215-20. Tamareselvy K, Rueggeberg FA. Dynamic mechanical analysis of two crosslinked copolymer systems. Dent Mater 1994;10:290-7. Daronch M, Rueggeberg FA, De Goes MF. Monomer conversion of pre-heated composite. J Dent Res 2005;84:663-7. Soares LE, Martin AA, Pinheiro AL, Pacheco MT. Vicker's hardness and Raman spectroscopy evaluation of a dental composite cured by an argon laser and a halogen lamp. J Biomed Opt 2004;9:601-8. Jimenez-Planas A, Martin J, Abalos C, Llamas R. Developments in polymerization lamps. Quintessence Int 2008;39:e74-84. Yoshikawa T, Burrow MF, Tagami J. A light curing method for improving marginal sealing and cavity wall adaptation of resin composite restorations. Dent Mater 2001;17:359-66.